So I looked at my passport today and it seems like my passport says I can only stay in the UK for forty eight hours? The writing is a bit hard to see, but the officer never mentioned that I could only stay for that long. I'm a bit confused whether I am going to have problems when I try to leave. I am trying to plan a weekend trip back to Holland, but I'm scared that when I try and leave they are not going to let me back into the UK. I plan on booking a ticket back to Canada. I was hoping that this would make it okay for me to stay in England if I had proof of leaving. Your leave-to-enter stamp clearly says something different from what you remember the IO telling you. Exactly how this happened is not really important now (but see below for a hypothesis), because you wouldn't be able to prove that he said something different from what the paperwork shows, anyway. First off, cancel that weekend trip. The risk that you will be denied entry back to the UK when you try to enter again is significant; you might well be detained until they can put you on a flight back to Canada. Second, don't panic. After your leave to enter expired on December 23, you are in principle not "legally present" anymore, but it appears that you do have a grace period of 90 days to leave on your own, barring further run-ins with the authorities. 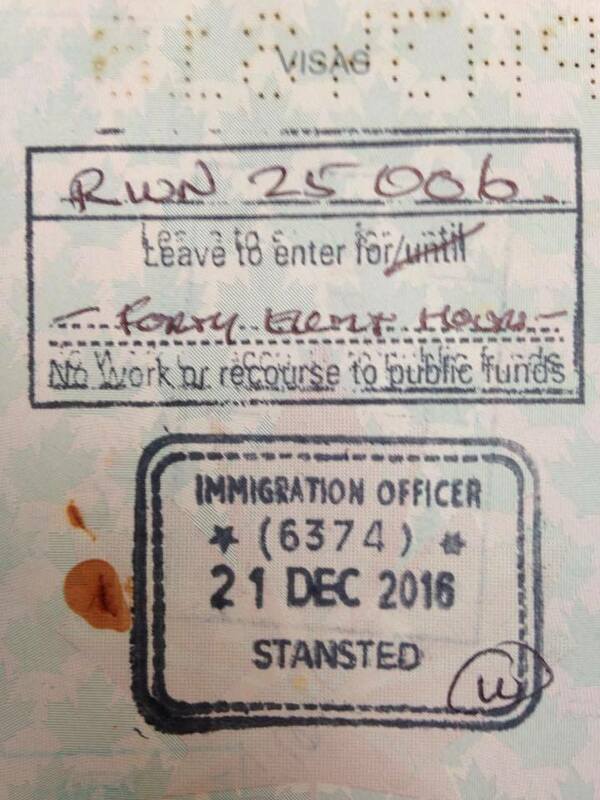 Leaving within this grace period will let you avoid an actual entry ban, though the overstay will still be on your record and may flag you for particularly tough questioning when you try to enter the UK in the future. (See paragraph 320(7B)(i) of the Immigration Rules). It is likely that this was what the IO had in mind when he acted like it was OK to you to stay for three weeks -- especially if we assume that you misheard him sightly and he actually meant that the short duration he put in will flag you up if you try to enter again, rather than when you leave. Canadians, Australians, and Kiwis can enter the UK on a one-way ticket. I see this stamp was placed in a Canadian passport and I find this odd. Usually a Canadian wouldn't get a 48-hour restriction like this unless one had overstayed or broken the conditions of one's stay in the past. Short of having any criminal convictions, most Canadians would not get this restriction unless one was looking like a junkie. I say this because a Canadian passport is looked upon very favourably by the British. It's a kind of stamp that you would expect a Mexican would get in a Mexican passport, not for a Canadian. Having that on a Canadian passport, your being seen as a persona non grata from the British authorities so someone fucked up big to get this. Not the answer you're looking for? Browse other questions tagged uk customs-and-immigration overstaying canadian-citizens passport-stamps or ask your own question. Does a previous overstay in Canada appear on my record if travelling with a new passport?